Fulton’s Foods is a frozen food retailer chain, which is based in Darton, South Yorkshire, and operates throughout The Midlands and the North of England. 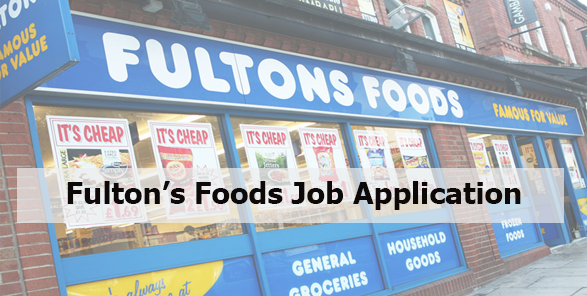 According to the information from and notifications of Human Resources Department of Fulton’s Foods Company, you can search for Fulton’s Foods recruitment notices and get information about the firm, as a result, apply for a job, from our website. Minimum age to work Fulton’s Foods: Age limit is 16 years or older. They operate Stores from Hull to Lancashire and Teeside to Nottingham, they are constantly expanding and are always looking for new staff. They have a Management training scheme for potential store Managers. They have a warehouse facility based in Darton, Barnsley and employ warehouse operatives and Heavy goods qualified Class 1 and 2. Fulton’s Foods Head office functions are also based here. In October 2005, it opened a 70,000 sq ft (6,500 m2) depot in Darton, South Yorkshire. and in March 2013, the company was rebranded Fulton’s Foods.